This article contains current data on biology, ecology, and cyanobacteria taxonomi. The results of analysis of bibliographic sources on conditions for nutrition, development and reproduction of cyanobacteria, pecularities of their life cycle, requirements for creating suitable conditions for their cultivation and methods for increasing their biomass production are discussed. An impact factor model on cyanobacteria development is considered and analyzed. Special attention is paid to analysis of information concerning optimal conditions for cyanobacteria cultivation, biomass separation and ways of biomass application for obtaining the target products. Castenholz, R. W., A Handbook on Habitats, Isolation, and Identification of Bacteria, Section B, Springer, Berlin Heidelberg 1981, pp. 236–246. De Vera, J.-P. P., Möhlmann, D., Leya, T., Photosynthesis activity of frozen cyanobacteria, snow alga and lichens as pre-tests for further on studies with simulation of Mars equatorial latitude temperatures, EPSC Abstracts 4(2009) 355. Sauer J., Schreiber U., Schmid R., Völker U., Forchhammer K: Nitrogen starvation-induced chlorosis in Synechococcus PCC 7942. Low-level photosynthesis as a mechanism of long-term survival. Plant Physiol. Van Baalen C: Studies on marine blue-green algae. Bot Mar. 1962, 4: 129–139. John R. P., Anisha G., Nampoothiri K. M., Pandey A.: Micro and macroalgal biomass: a renewable source for bioethanol. Bioresour Technol. 2011, 102: 186–193. 10.1016/j.biortech.2010.06.139. Aikawa S., Joseph A., Yamada R., Izumi Y., Yamagishi T., Matsuda F., Kawai H., Chang J.-S., Hasunuma T,. Kondo A.: Direct conversion of Spirulina to ethanol without pretreatment or enzymatic hydrolysis processes. Energy Environ Sci. 2013, 6: 1844–1849. 10.1039/c3ee40305j. Hoiczyk E., Hansel A.: Cyanobacterial cell walls: news from an unusual prokaryotic envelope. J Bacteriol. 2000, 182: 1191-1199. 10.1128/JB.182.5.1191-1199.2000. Stevens S., Balkwill D., Paone D.: The effects of nitrogen limitation on the ultrastructure of thecyanobacterium Agmenellum quadruplicatum. Arch Microbiol. 1981, 130: 204-212. 10.1007/BF00459520. Stevens S. E., Paone D. A., Balkwill D. L.: Accumulation of cyanophycin granules as a result of phosphate limitation in Agmenellum quadruplicatum. Plant Physiol. 1981, 67: 716–719. 10.1104/pp.67.4.716. Beck C., Knoop H., Axmann I. M., Steuer R.: The diversity of cyanobacterial metabolism: genome analysis of multiple phototrophic microorganisms. BMC Genomics. 2012, 13: 56-10.1186/1471-2164-13-56. Luque I., Forchhammer K.: Nitrogen assimilation and C/N balance sensing. The cyanobacteria: molecular biology, genomics and evolution. Edited by: Herrero A., Flores E. 2008, Norfolk: Caister Academic Press, 335–382. Schwarz R., Forchhammer K.: Acclimation of unicellular cyanobacteria to macronutrient deficiency: emergence of a complex network of cellular responses. Microbiology. 2005, 151: 2503-2514. 10.1099/mic.0.27883-0. Sauer J., Schreiber U., Schmid R., Völker U., Forchhammer K.: Nitrogen starvation-induced chlorosis in Synechococcus PCC 7942. Low-level photosynthesis as a mechanism of long-term survival. Plant Physiol. Paone D. A., Stevens S. E.: Nitrogen starvation and the regulation of glutamine synthetase in Agmenellum quadruplicatum. Plant Physiol. 1981, 67: 1097–1100. 10.1104/pp.67.6.1097. Choi S. P., Nguyen M. T., Sim S. J.: Enzymatic pretreatment of Chlamydomonas reinhardtii biomass for ethanol production. Bioresour Technol. 2010, 101:5330–5336. 10.1016/j.biortech.2010.02.026. Harun R., Danquah M. K., Forde G. M.: Microalgal biomass as a fermentation feedstock for bioethanol production. J Chem Technol Biotechnol. 2010, 85: 199–203. Harun R., Danquah M. K.: Influence of acid pretreatment on microalgal biomass for bioethanol production. Process Biochem. 2011, 46: 304–309. 10.1016/j. procbio.2010.08.027. Harun R., Jason W., Cherrington T., Danquah M. K.: Exploring alkaline pre-treatment of microalgal biomass for bioethanol production. Appl Energy. 2011, 88: 3464–3467. 10.1016/j.apenergy.2010.10.048. Nikiforov V. V. О metodakh podavleniya massovoho razvitiya sinezelenykh vodorostey / Nikiforov V. V. //Visnyk problem biolohii I medytsyny. – 2002. – Vyp. 4. – S. 27–31. Nikiforov V. V. Khimiko-toksykolohichni problemy pidhotovky pytnoi vody pry dii ekstremalnikh pryrodnykh chynnykiv / V. V. Nikiforov, Т. F. Kozlovska // Visnyk KDPU. – 2002. – Vyp. 5 (16). – S. 106–108. Elizarov О. І. Pro mozhlyvist vykorystanna hidrobiontiv dlya otrymanna biohazy / О. І. Elizarov, А. V. Luhovoy, V.V. Nikiforov //Visnyk KPDU. – 2006. – Vyp. 6(41). – S. 43–44. Nikiforov V. V. О metodakh podavleniya massovoho razvitiya sinezelenykh vodorostey / V. V. Nikiforov // Visnyk problem biolohii i medytsyny. – 2002. – Vyp. 4. – S. 27–31. Nikiforov V. V. Osobennosti khozyaystvennoho znacheniya sinezelenykh vodorostey v usloviyakh Kremenchuhskoho I Dneprodzerzhinskoho vodokhranilishch / V. V. Nikiforov, Т. F. Kozlovskaya / Visnyk KDPU. – 2002. – Vyp. 5(16). – S. 109–108. Nikiforov V. V. Khimiko-biolohicheskie prichiny ukhudsheniya kachestva prirodnoy vodi / V. V. Nikiforov, Т. F. Kozlovskaya // Visnyk KDPU. – 2002. – Vyp. 6(17). – S. 82–85. natsionalnoho universitetu. – 2001. – Т. 10, No. 1–2. – S. 99–105. Malovanyy V. S. Optimalni umovi otrymanna enerhii iz tsianobakteriy / М. S. Malovanyy, О. D. Sinelnikov, О. V. Kharlamova, А. М. Malovanyy // Khimichna promislovist Ukrainy. – 2014. – No. 5. – S. 39–43. Malovanyy М. S. Otsinuvanna ekolohichnoi nebezpeky v akvatoriyakh Dniprovskikh vodoskhovyshch vnaslidok nekontrolovanoho rozvitku tsianobakteriy / М. S.Malovanyy, V. V. Nikiforov, О. V. Kharlamova, О. D. Sinelnikov // Naukoviy visnyk NLTU Ukrainy. – 2015. – Vyp. 25.6. – S. 159–164. Malovanyy М. S. Vpliv hidrodynamichnoi kavitatsii na biolohichni objekty / М. S. Malovanyy, V. V. Nikiforov, О. D. Sinelnikov ta in. // Tekhnolohichnyy audit ta rezervy vyrobnytstva– 2015. – No. 5/4(25). – S. 41–45. А. Sinelnikov // Teoriya ustoychivoho razvitiya, Varna. – 2015. – №1(22). – S. 4–9. Malovanyy М. S. Vykorystanna zianobakteriy dlya otrymanna enerhonosiiv – shlyakh do unyknenna ekolohichnoi nebezpeky vid ikh nekontrolovanoho rosvytku v vodoskhovyshchakh Dniprovskoho kaskadu / М. S. Malovanyy, V. V. Nikiforov, О. V. Kharlamova, О. D. Sinelnikov // Stalyy rozvytok – ХХІ stolitta: upravlinna, tekhnolohii, modeli: Dyskusii 2015. – Cherkasy, 2015. – S. 352–361. MalovanyyM. 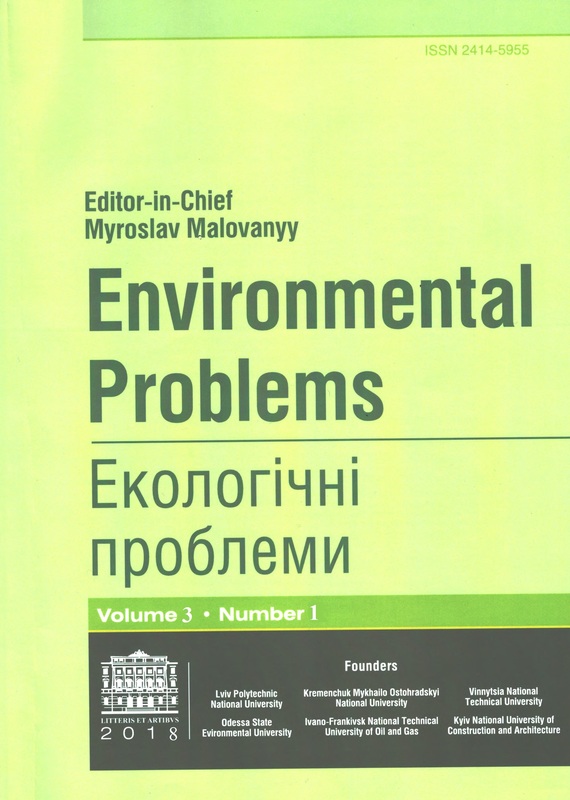 Prospects of combining in complex usage of different types of renewable energy and creation of renewable energy sources / M. Malovanyi, Y. Mahera, O. Zakhariv, O. Kharlamova O. Synelnikov // Naukovyy visnyk Natsionalnoho universitetu bioresursiv I pryrodokorystuvanna Ukrainy, Seriya “Biolohiya, biotekhnolohiya, ekolohiya”. – 2015. – No. 214. – S. 155–163. Malovanyy M. Mathematical model of the process of synthesis of biogas from blue-green algae / M. Malovanyy, V. Nykyforov, O. Kharlamova, O. Synelnikov // Ekolohichna bezpeka. – 2015. – №1/2015(19). – S. 58–63. Malovanyy М. S. Ratsionalna tekhnologiya utylizatsii synyo-zelenykh vodorostey / М. S. Malovanyy, V. V. Nikiforov, О. V. Kharlamova, О. D. Sinelnikov // Naukovyy visnyk NLTU Ukrainy. – 2015. – Vyp. 25.10. – S. 140–149. Chemistry & Chemical Technology. – Vol. 10, No. 2, 2016. – P. 252–254. Li Y. Effects of nitrogen sources on cell growth and lipid production of Neochloris oleoabundans / Y. Li, B. Wang, N. Wu, C. Q. Lan // Applied Microbiology and Biotechnology. – 2008. – No. 81(4). – Р. 629–636. Li Y. Biofuels from microalgae / Y. Li, M. Horsman, N. Wu, C. Q. Lan, N. Dubois-Calero // Biotechnology Progress. – 2008. – No. 24(4). – Р. 815–820. Sheehan J. A look back at the U. S. Department of Energy’s aquatic species program: biodiesel from algae / J. Sheehan, T. Dunahay, J. Benemann, P. Roessler // NREL/TP-580-24190, National Renewable Energy Laboratory, USA. – 1998. – 256 Р.
 Chisti Y. Biodiesel from microalgae / Y. Chisti // Biotechnology Advances. – 2007. – No. 25(3). – Р. 294–306. Hossain A. Biodiesel fuel production from algae as renewable energy / А. Hossain, A. Salleh, A. N. Boyce, P. Chowdhury, M. Naqiuddin // American Journal of Biochemistry and Biotechnology. – 2008. - No. 4(3). – Р. 250–254. Hu Q. Sommerfeld Microalgal triacylglycerols as feedstocks for biofuels production: perspectives and advances / Hu Q., Sommerfeld M., Jarvis E., Ghirardi M., Posewitz M., Seibert M., et al. // The Plant Journal. – 2008. – No. 54. – Р. 621–639. Rodolfi L. Microalgae for oil: strain selection, induction of lipid synthesis and outdoor mass cultivation in a lowcost photobioreactor / Rodolfi L., Zittelli G. C., Bassi N., Padovani G., Biondi N., Bonini G., et al. // Biotechnology and Bioengineering. – 2009. – No. 102(1). – Р. 100–112. Rosenberg J. N. A green light for engineered algae: redirecting metabolism to fuel a biotechnology revolution / J. N. Rosenberg, G. A. Oyler, L. Wilkinson, M. J. Betenbaugh // Current Opinion in Biotechnology. – 2008. – No. 19(5). – Р. 430–436. Schenk P. M. Second generation biofuels: high-efficiency microalgae for biodiesel production / Schenk P. M., Hall SR. T., Stephens E., Marx U. C., Mussgnug J. H., Posten C., et al. // Bioenergy Research. – 2008. – No. 1. – Р. 20–43. Tsukahara K. Liquid fuel production using microalgae / K. Tsukahara, S. Sawayama // Journal of the Japan Petroleum Institut. – 2005. – No. 48(5). – Р. 251–259. Grima M. E. Recovery of microalgal biomass and metabolites: process options and economics / M. E. Grima, E. H. Belarbi, F. G. A. Fernandez, A. R. Medina, Y. Chisti // Biotechnology Advance. – 2003. – No. 20 (7-8). – Р. 491–515. Weissman J. C. Design and analysis of microalgal open pond systems for the purpose of producing fuels: a subcontract report / J. C. Weissman, R. P. Goebel. – US DOESERI, 1987. – 456 р.
 Richmond A. Handbook of microalgal culture: biotechnology and applied phycology / A. Richmond. – Blackwell Science Ltd, 2004. – 322 р.
 Mata Teresa M. Microalgae for biodiesel production and other applications: A review / Teresa M. Mata, Antonio A. Martins, Nidia. S. Caetano // Renewable and Sustainable Energy Reviews, Vol. 14(1), 2010. – Р. 217–232. 2008. – No. 15(5). – Р. 898–902. Bozbas K. Biodiesel as an alternative motor fuel: production and policies in the European Union / K. Bozbas // Renewable and Sustainable Energy Reviews. – 2008. – No. 12. – Р. 542–552. Abed R., Dobretsov S., Sudesh K.: Applications of cyanobacteria in biotechnology. J Appl Microbiol. 2009, 106: 1-12. 10.1111/j.1365-2672.2008.03918.x. Canadian Council of Ministers of the Environment. Updated 1992. Canadian Water Quality Guidelines. Environment Canada. Carmichael, W. W., and L. D. Schwartz. 1984. Preventing Livestock Deaths from Blue-Green Algae Poisoning. U. S. Dept. of Ag., Farmer's Bull. No. 2275. 11 pp. Carmichael, W. W. 1991. Blue-Green Algae: An Overlooked Health Threat. In Health & Environment Digest, Freshwater Foundation. July, 1991. 5(6):1-4. Carmichael, W. W. 1992. A Review, Cyanobacteria secondary metabolites- the cyanotoxins. In J. Applied Bacteriology. 72:445-459. Echlin, P. 1966. The Blue-Green Algae. Scientific American, 214(6):74–81. Fay, P. 1983. The Blue-greens (Cyanophyta- Cyanobacteria). Edward Arnold (Pubs. ), Baltimore, MD. 88 pp. Haynes, R. C. 1988. Deptt of Env. Qual. Engg., Commonwealth of Massachusetts. An Introduction to the Blue-Green Algae (Cyanobacteria) with an Emphasis on Nuisance Species. North Am. Lake Manage. Soc. 19 pp. No. 693, National Eutrophication Survey, USEPA. 23 pp. Needham, J. G., and P. R. Needham. 1964. A guide to the study of Fresh-Water Biology. 5th Ed. Holden-Day, Inc., San Francisco, CA. 108 pp. Nishiwaki-Matsushima, R., T. Ohta, S. Nishiwaki, M. Suganuma, K. Kohyama, T. Ishikawa,W.W. Carmichael, and H. Fujiki. 1992. Liver tumor promotion by the cyano- bacterial cyclic peptide toxin microcystin-LR. In J. Cancer Res. Clin. Oncol, Springer-Verlag. 118:420-424. Rosgaard L., de Porcellinis A. J., Jacobsen J. H., Frigaard N.-U., Sakuragi Y: Bioengineering of carbon fixation, biofuels, and biochemicals in cyanobacteria and plants. J Biotechnol. 2012, 162: 134–147. 10.1016/j.jbiotec.2012.05.006. Soil & Water Conservation Society of Metro Halifax. 1992. Phytoplankton assemblages in six Halifax County lakes. 56 p.
 Soil & Water Conservation Society of Metro Halifax. 1993. Phytoplankton Assemblages in 21 Halifax Metro Lakes (Phase-B3 Limnology project), November 1993. 130 p.
 Soil & Water Conservation Society of Metro Halifax. 1993. Synopsis titled “Phytoplankton” (of fresh waters). 11p. Sumardiono, S.; Syaichurrozi, I.; Budi Sasongko, S. Utilization of Biogas as Carbon Dioxide Provider for Spirulina platensis Culture. Curr. Res. J. Biol. Sci. 2014, 6, 53–59. Wedepohl, R. E.,. Knauer D. R, Wolbert G. B., Olem H., Garrison P. J., and Kepford K.. 1990. Monitoring Lake and Reservoir Restoration. EPA 440/4-90-007. Prep. by N. Am. LakeManage. Soc. for U.S.E.P.A. 142 pp.